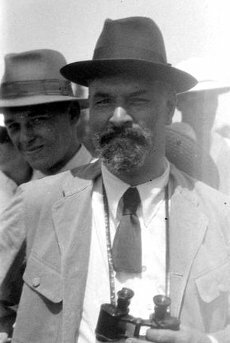 Zoologist Karel Dammerman is remembered primarily for his connection with the natural history of Indonesia, and in particular for his 1948 study The Fauna of Krakatau 1883-1933. This monograph chronicled the colonization history of the island after the catastrophic volcanic eruption of 1883, in so doing exploring several of the key elements of island biogeography equilibrium theory later worked out in mathematical detail by Robert MacArthur and Edward O. Wilson. Dammerman was for many years co-editor of the journal Treubia; his many other interests included science and museum administration, conservation, natural history field work, faunal evolution in reclaimed land parcels, and taxonomic nomenclature. --born in Arnhem, Netherlands, on 4 July 1885. --dies at Voorburg, Netherlands, on 19 November 1951. --Treubia, Vol. 21(2) (1952): 468-480. --Global Ecology and Biogeography Letters, Vol. 2(5) (1992): 145-148.